Malta continues to have “significant problems” with its groundwater levels, according to the EU’s environmental watchdog. The European Environment Agency’s European Waters report for 2018 says that Malta is among the three southern member states, the others being Cyprus and Spain, where the groundwater levels are drying up fast. The main pressures on the subterranean reservoirs, the agency said, was water extraction – the pumping out of water for public supply, agriculture and industry. Groundwater is found below the Earth’s surface in the fractures of rock formations and in soil pore spaces. In terms of what is known as the European water balance, groundwater aquifers only receive approximately one-tenth of the overall precipitation but provide around 42 per cent of the total water extraction in Europe, most of which is used for public water supplies and farming. About half of drinking water in Europe is taken from groundwater, and many large cities depend on it for their supplies. Despite this, the EEA report found that almost 90 per cent of groundwater bodies still enjoyed “good” status. As for Malta, the analysis said the island had the highest number of groundwater reserves described as being in a “poor” state – 80 per cent. The report goes on to say that Malta, and to a lesser extent Cyprus, depended heavily on groundwater resources to meet their needs, with Malta extracting around 60 per cent from subterranean reserves. 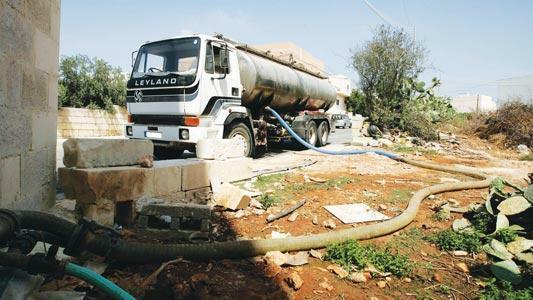 In May, the Times of Malta reported how groundwater extraction was being measured by the Water Services Corporation, but the State entity would not comment when asked about serious concerns that the water table was being depleted. Some consumers also complained about the illegal extraction of groundwater, which was being offered to fill pools at far cheaper rates than regular water tariffs. The EEA report is not the first to highlight the problem in Malta. According to the World Resource Institute, Malta is among the world’s most water-stressed countries. In its latest report on the situation, published in 2016, the institute said that the island’s groundwater reserves were being depleted and were severely affected by both nitrate pollution and increasing salinity – consequences of largely unregulated human activities. Three years ago, the Today Public Policy Institute lamented in a report that the island had become increasingly dependent on energy-intensive desalination. However, groundwater continued to contribute most of the water used in the country, especially for water-thirsty agriculture during the dry seasons. Inadequately regulated private groundwater extraction was exacerbating the situation further, the now-defunct Today Public Policy think tank said.